Panorama confronts the men it says inspired the London Nailbomber David Copeland. The programme reveals that Copeland was inspired by known right-wing extremists who fed him a diet of Nazi literature and propaganda. 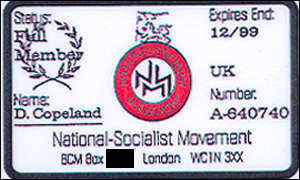 Copeland joined the extreme right-wing group, The National Socialist Movement, in January 1999, just three months before his bombing campaign began. Panorama exposes three members of this very small but very violent neo-nazi group. Their whole programme is one of terrorism, either in the written word or in actual fact, against Jews, against blacks and against Asians. Steve Sargent, from Essex, was one of the hard-line nazis who split away from Combat 18 to set up the NSM in 1997. When Copeland applied to join, Sargent was one of those who approved his membership. NSM leader Tony Williams wrote to Copeland to tell him he had been accepted as a full NSM member. In February 1999, Williams wrote to Copeland again, appointing him Unit Leader, in charge of the NSM in his own area. The letter said "Welcome to leadership, responsibility and accountability to your comrades. Yours ever, Heil Hitler." But like Steve Sargent, Williams was not at all keen to discuss with Panorama his involvement with Copeland. But the man whose ideas had more influence than most on Copeland was David Myatt from Worcestershire, founder member of the NSM and its first leader. He once said the nazi movement needed people "prepared to fight, prepared to get their hands dirty, and perhaps spill some blood." Myatt, the group's intellectual, shaped the ideas that propelled David Copeland on his road to terrorism. He was confronted by Panorama reporter Graeme McLagan but refused to comment. But despite many letters between Copeland and his political leaders, when his terror campaign began, the police Special Branch had never heard of David Copeland. Gerry Gable, of Searchlight magazine, says "It is beyond me why a clearly established extremist group advocating violence publicly like the NSM, is not monitored"
For almost forty years Gerry Gable and his magazine Searchlight have been keeping a close watch on the extreme right. One of their infiltrators in the BNP, codenamed Arthur, got to know David Copeland in the summer of 1997 when he first joined the party. It was probably while he was in the BNP that Copeland came across the Turner Diaries. The book, which is sold through BNP magazines, also provided Oklahoma bomber Timothy McVeigh with his ideas and method. When David Copeland was arrested he admitted that the book had influenced him. Gable says "I think that there was a transitional period for him as a young man between going from the BNP to something even more extreme if you can imagine that and I think the transition was the reading of hate literature, probably seeing hate videos, probably listening to music that's full of hate lyrics, and deciding that the BNP, to some extent, in its present form, is a bit of a paper tiger." Copeland is a self-confessed neo nazi. In his confession he stated "Why attack blacks and Asians? Because I don't like them. I want them out of this country. I'm a national socialist. Nazi. I believe in the master race."